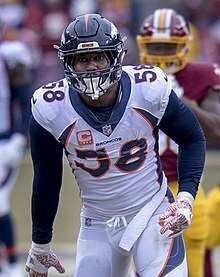 Vonnie B'Vsean Miller Jr. (born March 26, 1989) is an American football outside linebacker for the Denver Broncos of the National Football League (NFL). Miller played college football at Texas A&M, where he earned consensus All-American honors and was awarded the Butkus Award as the most outstanding college linebacker in the nation. He was drafted by the Broncos second overall in the 2011 NFL Draft. Considered among the best defenders in the league, he is a seven-time Pro Bowl selection, receiving first-team All-Pro honors as a rookie. At the conclusion of the 2015 NFL season, Miller was named Super Bowl MVP after the Broncos defeated the Carolina Panthers in Super Bowl 50. Following his Super Bowl victory, he appeared on season 22 of Dancing with the Stars. Miller attended DeSoto High School in DeSoto, Texas, where he played for the DeSoto Eagles high school football team and ran track. In his junior year, he recorded 37 tackles, 14 tackles for loss, 7 sacks and 12 quarterback hurries. As a senior, he was named the District 8-5A Defensive MVP after making 76 tackles, 14 tackles for loss and 6 sacks. He played with future Aggie teammate Cyrus Gray. In Spring 2008, newly hired head coach Mike Sherman was discouraged by Miller's habits of skipping class and failing to produce during practice. Sherman decided to suspend Miller for that spring. Disappointed, Miller considered transferring, but upon his father's insistence, stayed. Miller then adopted a more serious attitude. As a sophomore in 2008, Miller played at weakside linebacker under Joe Kines's 4–3 defense. He saw action in all 12 games, making 44 tackles, including 25 solo stops, and leading the team with 3.5 sacks. He made 7.5 tackles for loss, forced two fumbles, and recovered two more. His role was more confined to pass coverage, as opposed to rushing the quarterback, thus he wasn't able to showcase his pass-rushing abilities. In the final seven Big 12 games, he compiled just eight tackles. As a senior in 2010, Miller switched to playing as a 3–4 outside linebacker under Tim DeRuyter's defense. Early in the season, Miller suffered a high ankle sprain that held him back for the first six games. He posted 10.5 sacks and 17.5 tackles for loss. Again he made first-team All-Big 12 honors and won the Butkus Award as the nation's top linebacker. He was also named a consensus first-team All-American. He received first team All-American honors from Walter Camp, Scout.com, Pro Football Weekly, ESPN.com and the Associated Press. Miller graduated with a degree in poultry science and raises chickens in his spare time. Miller was projected to be a second round pick in the 2010 NFL Draft had he passed on his senior season. He entered the 2011 NFL Draft regarded as one of the best 3–4 outside linebackers available by NFL draft experts and scouts and was projected to be a top five draft pick. At the 2011 Senior Bowl, Miller was the Defensive MVP. Among linebackers at the 2011 NFL Combine, Miller ranked 2nd in the 40-yard dash, 3rd in the vertical jump, 1st in the broad jump, 3rd in the 20-yard shuttle, T-1st in the 3-cone drill, and 1st in the 60-yard shuttle. His 11.15-second 60-yard shuttle broke the combine linebacker record. At the Texas A&M Pro Day in March 2011, Miller ran a 4.49 40-yard dash. In March 2011, Miller was selected to represent top flight rookies in the NFL Labor Union talks. He was persuaded by former NFL running back LaDainian Tomlinson to join the lawsuit. During the Texas A&M Pro Day, however, one scout compared him to Hall of Famer Derrick Thomas, while Bengals defensive coordinator Mike Zimmer compared him to Cardinals linebacker Joey Porter. NFL Network Analyst Mike Mayock, who rated Miller as the second-best player in the draft, stated that Miller reminds him of a smaller version of DeMarcus Ware. Miller's then-personal trainer, Dan Brandenburg, who also worked with first round picks Clay Matthews III and Sean Weatherspoon, stated Miller is the best athlete of all three. On September 12, 2011, in his first career play from scrimmage, Miller forced a fumble against the Oakland Raiders. On September 18, 2011, he had his first sack on Andy Dalton when the Broncos played the Cincinnati Bengals. Miller was named the AFC Defensive Player of the Week for his Week 11 performance against the New York Jets. The Broncos made the playoffs and faced off against the Pittsburgh Steelers in the Wild Card Round. In his playoff debut, Miller had three solo tackles and one quarterback hit in the 29–23 overtime victory. In the Divisional Round against the New England Patriots, he had two quarterback hits in the 45-10 loss. Miller got off to a quick start in his second season, registering 10 sacks in nine games. In this period, he recorded 30 quarterback hurries, more than he had during his entire 2011 campaign. Thanks to this tremendous start, he was considered an MVP candidate. On November 16, he was fined $21,000 for a hit on Carolina Panthers quarterback Cam Newton in Week 10. He received his second career AFC Defensive Player of the Week honor after recording three sacks and two forced fumbles against the San Diego Chargers the following week. For his efforts during the month of November, he was awarded AFC Defensive Player of the Month. On December 26, 2012, he was announced the starting Outside Linebacker in the AFC division for the 2013 Pro Bowl. 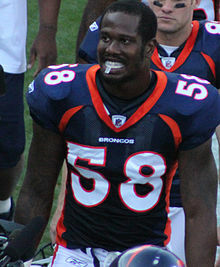 Miller finished the season third in sacks with eighteen and a half, breaking a Denver Broncos record of seventeen previously held by Elvis Dumervil. He also capped off the 2012 season finishing second in voting for Defensive Player of the Year and being named first-team All-Pro. In the Divisional Round of the playoffs, Miller had nine total tackles and two quarterback hits in the 38–35 2OT loss to the Baltimore Ravens. Prior to the 2013 season, NFL Network listed Miller as the 9th-ranked player in its NFL: The Top 100 Players of 2013 program, which is voted on by players in the NFL. In July 2013, ESPN reported that Miller had been suspended four games for violating league policy, pending appeal. He tweeted that he did "nothing wrong". In August 2013, he lost the appeal and was suspended for six games. The six-game suspension arose after the NFL learned that he attempted to cheat a drug test. He became eligible to play on October 20, 2013, when the Broncos played the Indianapolis Colts. On November 24, in a loss to the New England Patriots, he recovered a Stevan Ridley fumble and took it 60 yards for a touchdown. It was the second touchdown of his career. He did fairly well upon his return, but his season was ended prematurely when he tore his ACL on December 22, 2013 during a win on the road at the Houston Texans. Without him, the Broncos reached Super Bowl XLVIII, but lost 43–8 to the Seattle Seahawks. After recovering from his ACL injury, Miller looked to improve his play in his fourth season with the Broncos. He did so with 14 sacks, 59 tackles, and a forced fumble. In the Divisional Round of the playoffs against the dianapolis Colts, he had six total tackles and one quarterback hit in the 24–13 loss. On September 17, 2015, Miller became the third-fastest player in NFL history to reach 50 sacks career (58 games). The only ones to get there faster than him were Reggie White (40 games) and Derrick Thomas (54). Overall, in the 2015 season, Miller finished with 11 sacks, 35 total tackles, 32 quarterback hits, one pass defensed, and four forced fumbles. In the Divisional Round against the Pittsburgh Steelers, he had two total tackles in the 23–16 victory. During the AFC Championship against the New England Patriots, Miller sacked Tom Brady 2.5 times, breaking a Broncos single-game playoff record and also had an interception in the second quarter of the game. In Super Bowl 50, facing the heavily favored Carolina Panthers who held the top-ranked offense, the Broncos won 24–10. In the first quarter, on a 3rd-and-10 from the 15-yard line, Miller knocked the ball out of Panthers quarterback Cam Newton's hands while sacking him, and defensive end Malik Jackson recovered it in the end zone for a Broncos touchdown, giving the team a 10–0 lead. This was the first fumble return touchdown in a Super Bowl since Super Bowl XXVIII. With 4:51 left in regulation and the Broncos leading 16–10, Miller forced a second fumble from Newton to end the Panthers' potential game-winning drive, and the Broncos offense afterwards scored a touchdown to seal the victory. Miller recorded six tackles, 2.5 sacks, two forced fumbles, and two quarterback hurries, and was named Super Bowl MVP for his performance. Miller was named to his fourth Pro Bowl, earned his second First-team All-Pro, and was ranked 15th by his fellow players on the NFL Top 100 Players of 2016. On March 1, 2016, the Broncos placed the exclusive franchise tag on Miller. On July 15, Miller signed a 6-year deal worth $114.5 million featuring $70 million guaranteed with the Broncos. He became the highest paid defensive player in NFL history, with the highest amount of guaranteed salary. Miller finished the 2016 regular season with 13.5 sacks and 24 quarterback hits. In the last four games of the season, Miller did not record a sack, which was the longest such stretch in his career. He was named to his fifth career and third consecutive Pro Bowl, and his third First-team All-Pro, and was ranked second by his fellow players on the NFL Top 100 Players of 2017 as the highest ranked defensive player. On December 19, 2017, Miller was named to his sixth Pro Bowl. Miller was named the 2018 Pro Bowl defensive MVP. In the 2017 season, he recorded his fourth consecutive season with at least ten sacks. In the Broncos' 2018 season opener against the Seattle Seahawks, Miller recorded three sacks and seven total tackles in the 27–24 victory. In Week 11, Miller intercepted Philip Rivers and returned it 42 yards to set up a touchdown, which helped ignite a 23-22 comeback win over the Los Angeles Chargers, earning him AFC Defensive Player of the Week. During the 2018 season, Miller recorded his 100th career sack (including postseason sacks), becoming the 5th-fastest player in NFL history to do so. He was also selected to the 2019 Pro Bowl as a starting outside linebacker, which was his seventh career and fifth consecutive Pro Bowl. In April 2018, while on a guided fishing tour off the coast of Florida, Miller is alleged to have illegally landed a hammerhead shark. He is currently under investigation. In 2012, Miller created Von's Vision to provide Denver-area youth with eye examinations and eyewear. Von's Vision hosts Von's Vision Days throughout the year to provide children with free eye exams and glasses. Von Miller's organization hosts two events for Denver-area children: Von's Vision Day and Von Miller's Back to School Vision Day. Von's Vision Day is a two-day program. The foundation partners with national and regional eyewear retailers to provide a citywide vision day for low-income Denver children. On the first day of the program, children receive free screenings, and if needed, free eye exams and an invitation to pick up their corrective eyewear at a later date. After the prescription glasses have been cut, Von hosts a Reveal Party where children are fitted for their glasses. Children have the opportunity to interact with Von Miller and feel comfortable in their new glasses. Started in 2015, Von Miller hosts an annual vision day to serve children before they head back to school called Von Miller's Back to School Vision Day. Every year 5,000 low-income 1st grade students enter the Denver Public School System without ever seeing an eye doctor. More than 1,900 of them need glasses. The program is designed to screen a child and, if needed, provide them with eyewear in a matter of minutes. Von Miller's Back to School Vision Day is designed to screen, write prescriptions, cut lenses and fit the glasses in under an hour. ^ "NFL #58 Von Miller - ESPN". M.espn.go.com. March 26, 1989. Retrieved February 8, 2016. ^ "Player Bio: Von Miller". Texas A&M Official Athletic Site. Archived from the original on September 10, 2008. Retrieved December 19, 2010. ^ "Von Miller cherishes Dallas roots heading into NFL Draft". MaxPreps.com. Retrieved February 8, 2016. ^ "Von Miller". Archived from the original on February 22, 2016. Retrieved February 8, 2016. ^ "Rivals". Retrieved February 8, 2016. ^ "Von Miller 2007 Game Log". College Football at Sports-Reference.com. Retrieved February 13, 2019. ^ a b c d "Locked Out And Loaded". CNN. April 18, 2011. Archived from the original on November 4, 2012. ^ "Miller's return to Texas A&M: the right decision". Fox Sports Southwest. March 11, 2011. Retrieved March 18, 2011. ^ "Von Miller 2008 Game Log". College Football at Sports-Reference.com. Retrieved February 13, 2019. ^ a b Lande, Russ (December 15, 2010). "Draft Dish: Nevada QB Colin Kaepernick moving up draft boards". Sporting News. Archived from the original on December 11, 2010. Retrieved December 19, 2010. ^ "2009 Sporting News college football All-America first team". ^ "SI.com's 2009 All-Americas". CNN. December 15, 2009. ^ "Will Aggies make it Von Miller time?". Statesman.com. November 7, 2009. Archived from the original on November 20, 2010. Retrieved March 18, 2011. ^ "Von Miller runs a 4.49". National Football Post. March 9, 2011. Archived from the original on March 11, 2011. Retrieved March 18, 2011. ^ "Von Miller 2009 Game Log". College Football at Sports-Reference.com. Retrieved February 13, 2019. ^ "Von Miller 2010 Game Log". College Football at Sports-Reference.com. Retrieved February 13, 2019. ^ Herndon, Mike (January 28, 2011). "It's Von Miller's time to shine at Senior Bowl". Mobile Press-Register. Retrieved March 11, 2011. ^ "All-Big 12 Football Awards Announced – Big 12 Conference – Official Athletic Site". Big12sports.com. November 30, 2010. Retrieved December 19, 2010. ^ "A&M's Von Miller wins Butkus Award". AggieSports.com. December 8, 2010. Retrieved December 19, 2010. ^ "College Football's 2010 Consensus All-Americans". NCAAfootball.fanhouse.com. December 20, 2010. Retrieved March 11, 2011. ^ "PFW's 2010 All-America team". Pro Football Weekly. December 21, 2010. Archived from the original on December 25, 2010. Retrieved March 11, 2011. ^ "ESPN.com's 2010 All-American Team". ESPN. Retrieved March 11, 2011. ^ "AP All-America Team, List". St. Petersburg Times. Retrieved December 19, 2010. ^ "Von Miller uses Texas A&M major to start poultry farm at Dallas home". May 2, 2013. ^ Zwerneman, Brent (November 24, 2010). "A&M can be thankful it's still Miller time: LB passed up NFL for senior year with Aggies". Houston Chronicle. ^ Pauline, Tony (December 13, 2010). "Bruce Carter, Akeem Ayers headline list of top-10 draft-eligible linebackers". Sports Illustrated. ^ "NFL Draft 2011 – ESPN". Espn.go.com. Retrieved March 11, 2011. ^ Lande, Russ (December 23, 2010). "Mock Draft: Luck would re-energize Panthers' listless offense". Sporting News. Archived from the original on December 24, 2010. Retrieved December 23, 2010. ^ Kiper, Mel (March 9, 2011). "2011 NFL Mock Draft 3.0". ESPN.com. ^ "Miller at No. 3 makes sense for Bills". Pro Football Weekly. February 5, 2011. Archived from the original on February 10, 2011. Retrieved March 11, 2011. ^ "Von Miller runs a 4.49". National Football Post. March 9, 2011. Archived from the original on March 11, 2011. Retrieved March 11, 2011. ^ Davis, Nate (February 28, 2011). "OLB Von Miller justifying NFL draft stock with strong combine". USA Today. Retrieved March 11, 2011. ^ "Von Miller cements his top billing". NFL.com Blogs. February 28, 2011. Retrieved March 11, 2011. ^ Williamson, Bill. "Will Von Miller be blackballed?". ESPN, AFC West Blog. Retrieved March 18, 2011. ^ Williams, Charean (March 9, 2011). "Texas A&M product Von Miller continues to impress NFL scouts". Fort Worth Star Telegram. Retrieved March 18, 2011. ^ "news: Defensive players lead the way on list of top 32 prospects". NFL.com. Retrieved March 18, 2011. ^ "2011 NFL Draft Listing". Pro-Football-Reference.com. Retrieved February 13, 2019. ^ Zwerneman, Brent (March 2, 2011). "Hurdling serves Miller well: Star survives many pitfalls by clearing obstacles". Houston Chronicle. ^ "John Elway suddenly likes No. 58". ESPN.com. Retrieved February 8, 2016. ^ "Rookie LB centerpiece of Elway's Broncos". ESPN.com. Retrieved February 8, 2016. ^ "Oakland Raiders at Denver Broncos - September 12th, 2011". Pro-Football-Reference.com. Retrieved February 13, 2019. ^ "Broncos' McGahee rushes for 101 yards against Bengals". Denver Post. September 19, 2011. ^ "Wild Card - Pittsburgh Steelers at Denver Broncos - January 8th, 2012". Pro-Football-Reference.com. Retrieved February 13, 2019. ^ "Divisional Round - Denver Broncos at New England Patriots - January 14th, 2012". Pro-Football-Reference.com. Retrieved February 13, 2019. ^ Jones, Lindsay H. (December 27, 2011). "Broncos Bailey, Miller, Dumervil make NFL Pro Bowl roster; Tebow an alternate". Denver Post. ^ "'The NFL Beat': Awards Shower". Retrieved February 8, 2016. ^ "Von Miller's fine total rises". ESPN.com. Retrieved February 8, 2016. ^ "Von Miller wins AFC defensive player of the week honors - ProFootballTalk". Retrieved February 8, 2016. ^ "2012 NFL All-Pros". Pro-Football-Reference.com. Retrieved February 13, 2019. ^ "Divisional Round - Baltimore Ravens at Denver Broncos - January 12th, 2013". Pro-Football-Reference.com. Retrieved February 13, 2019. ^ "'Hip-Hop Experience' mercifully helping Von Miller reinvent his sack dance". CBSSports.com. Retrieved February 8, 2016. ^ "Top 100 Players of 2013". NFL.com. Retrieved February 8, 2016. ^ Jones, Lindsay H. (September 22, 2013). "Broncos' Von Miller tried to swap out urine sample". USA Today. ^ "Von Miller of Denver Broncos, urine collector tried to cheat test". Espn.go.com. September 22, 2013. Retrieved February 8, 2016. ^ "Denver Broncos at New England Patriots - November 24th, 2013". Pro-Football-Reference.com. Retrieved February 13, 2019. ^ Jones, Ross (December 23, 2013). "Von Miller suffers dreaded torn ACL | FOX Sports". Msn.foxsports.com. Retrieved February 8, 2016. ^ Benjamin Hochman The Denver Post (October 6, 2014). "Hochman: Broncos' Von Miller is back, and that's bad news for opponents". Retrieved February 8, 2016. ^ "Von Miller 2014 Game Log". Pro-Football-Reference.com. Retrieved February 13, 2019. ^ "Divisional Round - Indianapolis Colts at Denver Broncos - January 11th, 2015". Pro-Football-Reference.com. Retrieved February 13, 2019. ^ "NFL - Von Miller third-fastest to 50 sacks in NFL history". 247sports.com. Retrieved September 18, 2015. ^ "Von Miller 2015 Game Log". Pro-Football-Reference.com. Retrieved February 13, 2019. ^ "Divisional Round - Pittsburgh Steelers at Denver Broncos - January 17th, 2016". Pro-Football-Reference.com. Retrieved February 13, 2019. ^ "Broncos LB Von Miller makes life hell for Tom Brady". NFL.com. Retrieved February 8, 2016. ^ Martin, Jill (February 8, 2016). "Super Bowl 2016: Broncos' defense dominates as Peyton Manning wins second title". CNN. ^ Alper, Josh (February 7, 2016). "Von Miller wins Super Bowl 50 MVP". Retrieved February 8, 2016. ^ "'Top 100 Players of 2016': No. 15 Von Miller". NFL.com. ^ Rosenthal, Gregg (March 1, 2016). "Von Miller franchise tagged by Denver Broncos". NFL.com. Retrieved March 12, 2016. ^ Orr, Connor (July 15, 2016). "Von Miller, Broncos agree on six-year, $114.5M deal". NFL.com. Retrieved July 15, 2016. ^ Klis, Mike (July 15, 2016). "Von Miller expected to accept Broncos' $114.5 million offer by deadline". USA TODAY. Retrieved July 15, 2016. ^ "Von Miller 2016 Game Log". Pro-Football-Reference.com. Retrieved February 13, 2019. ^ "Who should win NFL awards for 2016? Here's a guide". ESPN.com. ^ "NFL Top 100 Players hit or miss 💯of 2017 - No. 2 Von Miller". ^ "Von Miller named Pro Bowl defensive MVP after win-sealing strip-sack". The Denver Post. January 28, 2018. Retrieved October 3, 2018. ^ "Von Miller 2017 Game Log". Pro-Football-Reference.com. Retrieved October 3, 2018. ^ "Von Miller wrecks Seahawks on three-sack day". NFL.com. Retrieved October 3, 2018. ^ "NFL reveals rosters for 2019 Pro Bowl in Orlando". NFL. Retrieved January 1, 2019. ^ "Von Miller Stats". ESPN.com. ^ Mihoces, Gary (April 25, 2011). "Draft stud Von Miller is well-suited for labor fight and NFL". USA Today. ^ "Super Bowl MVP Von Miller is also a chicken farmer". SBNation.com. February 8, 2016. Retrieved February 8, 2016. Miller, a poultry science minor at Texas A&M, is actually a chicken farmer. 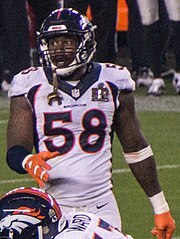 ^ "Denver Broncos linebacker Von Miller arrested on outstanding traffic warrant at Centennial Gun Club". Thedenverchannel.com. August 14, 2013. Archived from the original on October 16, 2013. ^ "Von Miller cited for driving without license, speeding". USA Today. September 11, 2013. ^ "Broncos LB Miller investigated for shark catch". ESPN.com. Retrieved April 5, 2018. ^ "Von Miller | Von's Vision Foundation | A Prolanthropy-Managed Organization". vonmiller.org. Retrieved March 1, 2016. ^ PR, Broncos. "DENVER BRONOCS' VON MILLER HOSTS VON'S VISION DAY, INVITES 200 UNDERPRIVELAGED CHILDREN IN NEED OF EYE SCREENING". www.kktv.com. Retrieved March 9, 2016. ^ "Von Miller | Von's Vision Foundation | A Prolanthropy-Managed Organization". vonmiller.org. Retrieved March 9, 2016. 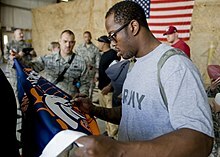 ^ "Broncos Linebacker Von Miller Helps Kids See Better". Retrieved March 9, 2016. ^ "Von Miller | Von's Vision Foundation | A Prolanthropy-Managed Organization". www.vonmiller.org. Retrieved March 9, 2016. ^ "Von's Vision provides glasses to school kids". prod.www.broncos.clubs.nfl.com. Archived from the original on March 10, 2016. Retrieved March 9, 2016.